Marieke & Megan Tackle Dirty Kanza! Welcome to the Flint Hills! What makes someone ride 200 miles on dirt roads in the tire chewing Flint Hills of eastern Kansas? I actually don’t know, but it is rewarding! Soon after I got my Niner RLT gravel bike in the Spring of 2015, I learned about the Dirty Kanza and could not let go of the thought of one day riding this race. It seemed like an intriguing challenge to be skilled and strong enough to manage the dirt terrain and able to deal with mechanical issues and weather changes during the race. I rode a few local gravel grinders to test things out and I only got more and more determined and my rides got gradually longer. The cool thing about gravel grinding is that it expands your horizons. I explored so many new roads and new places, even though I have lived in the same area for about 20 years it has opened a whole new world. 2017 was my first year and things went very well. The conditions were optimal then and course records were set. Of course, I had to sign up again. This year I was nervous to get in the lottery, but I made it in. After a stressful start of 2018 when I picked up the flu, lost my job for a while, and dug myself a deep physical and mental hole, I could barely even ride my bike. I did get help and had a training schedule made that very gradually built up. I was impatient and only slowly started to feel better on and also off my bike. Training for the Kanza does take a lot of time: in the weekends towards race day I would usually ride both days for many hours and did shorter rides during the week. Sorry to everyone in my life whom I neglected. Riding in the Flint Hills sometimes feels like an interval training with short calf-biting climbs out of the plenty river crossings, many rollers, and a few real hills that are all longer than you think. Yes, better prepare for it as Kansas is not flat! Running down 6 flights of stairs before the start as the elevators backed up in the dorms was a good warmup before we learned the start was delayed by 30 minutes (Photo: Francien Dechesne). Seeking shelter before the start (Photo: Francien Dechesne). Counting down at the start (Photo: Francien Dechesne). My sister, Francien, was my crew and mechanic this year and since she rode the Kanza last year she knew exactly what her job was: lube my chain, check tires, change out camel bags and hand me food. Oh, and point me to the bathroom, which is not always obvious. She was great and I was very happy to see her in Madison and every stop after. The second leg flew by with some tailwinds here and there and was good for the spirits. I enjoyed the waiving grasses and felt like I was flying at times. Maybe I felt a little too good in hindsight, I was only halfway in Eureka. When we turned into the strong northern headwinds at about mile 110 between stop 2 and 3 it did not take long before I burned through my diminishing reserves in my legs quickly and tiredness crept in. I tried to trade of pulls in the wind with some other riders but these groups never lasted for too long. Nearing Madison I was often alone. The optimism from before Eureka had faded. I now had started to worry about beating the Sun and reverted to the thought that just finishing would be good enough, avoiding truly bonking with everything I could. Disillusioned riders waiting for a parked train blocking the course, while the sun set! After 50 minutes of waiting a detour was authorized to get around it. In Madison, Francien told me that I still had a chance to make the sun cutoff and on we went. I found a little group to battle the still strong headwinds and we traded places for a long time. However, just a few miles after the Salsa Chaise it was clear that there were a bunch of people gathered at the train crossing. We slowed down and learned that some of them been there for 20 minutes already waiting for a parked train at mile 199 of the race. Oh oh…. And in the distance the sun set. Disillusioned riders were scattered all over now and the pack was growing. Another train passed, but no movement on the parked train. Finally, a car arrived to inform us that a 3.5-mile detour had been authorized to the finish. A bit confused we all started riding. The energy in the peloton was jittery. Enough wheels to grab for the last 8 + detour miles and there was not much thinking. We just went fast in the dark, still trying to beat the Sun (which had long set) straight through unannounced potholes, up the last hill and then the finish was there. I was blinded by all the lights, overwhelmed by all the cheering people and just so happy. I did it, I had finished again! I will just have to come back next year to take revenge on that train. Overwhelming happiness at the finish after battling headwinds and trains (Photo: Francien Dechesne). We did it! (Photo: Francien Dechesne). I found my sister, a happy reunion, and we waited for Bike Ambassador teammate Megan who was riding single speed, a heroic accomplishment in these winds. 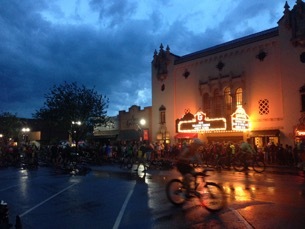 The best thing about the Kanza is that the entire town of Emporia goes all out for biking. It gets flooded with cyclists from all over the world and people are very welcoming. The feel of that entire community is the most amazing part of the Kanza experience and it is so great to be part of that! I am also proud to be one of the 200 women on the 200 miles. -Why you decided to participate in DK: After the DK100 in 2015 (the "mud year"), and a failed attempt in 2016 (bailed at mile 165), and being too injured in 2017 to race, I had some serious unfinished business this year! Not only that though, this event is magical. Jim and LeLan have done an amazing job with this event, as has the town of Emporia. You've never seen anything like it. I couldn't wait to get back -to see friends from KS and MO and NE that I don't get to see often, and to take another stab at finishing my first DK200. -What kind of bike you rode: I went all in and dropped all the gears but one. That's right- I went singlespeed. I figured it was the best way to force myself to slow down and focus on the finish first, and the race second. The one gear forces me to put one foot in front of the other, to coast quite often, and to sit up and look around. It was everything I hoped for, and more. How you prepared for the race - tips and advice to share with people considering doing the race next year: I did lots of miles this spring (overall targeting the 10,000 miles this year helps! ), and the AZ Gravel Chino Grinder 105 mile gravel race back in early May. That was perfect tune-up. I also did the math on number of calories I needed to each (approx 100-150/hour), how many bottles of fluid I needed to be successful (about 1/hour, or around 18-19 for the day), and mentally, things I could think about and focus on during the really awful solo, headwind stretches (I literally called my therapist on the drive to DK and we talked about "homework" I could work on in my head during the race. And it totally worked). Your impressions/thoughts before, during and after the race: everything I'd hoped it would be and more. We began with a sponsors VIP event Thursday night, Friday morning I set up our tent in the expo and embarked on the group shake-out ride, made my way back to the expo, then cleaned up and helped co-moderate the women's panel, back to the expo, we packed up, I rested up and then it was race morning! Any message that you would like to share to inspire/motivate people to participate next year: Add this to your race list, your bucket list, your life list. This is a truly special event -one you must experience to understand. Whether you do the DK100 or DK200 (or 350 XL!) you must must must race this event at least once. You've got till 3am to finish. And you'll learn so much about yourself out there. Megan is a lawyer. She is a cycling advocate and team leader. 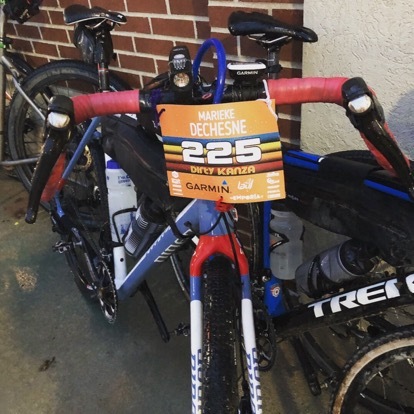 She is a finisher of the Dirty Kanza 100! Tell us about your biking: I ride ALLLLLL the bikes My stable includes MTB, CX (one is a SS), Road bike, TT bike, Track bike and fat bike. All Cannondales except for my track bike and Spot CX belt drive. Plus my 1995 Bridgestone commuter (first “real” bike I got – bought it when I was 15!). I started road racing around 2002-2003 and raced road and then track through 2011. I began switching to more CX and gravel races in 2012-2013 and am firmly hooked on the long distance stuff now. Long gravel races like Kanza and also Ironman triathlons – I just completed my second IM a few weeks ago. Beyond riding for fitness and fun, I also began using my bikes for transportation in earnest in 2012… I ride to work, for groceries, to the bank, library, hair salon, you name it … I LOVE the days my car never leaves the garage. I enjoy riding bikes in a kit but also in jeans and a dress coat too. I think it’s good for motorists to see us in all forms of cycling.